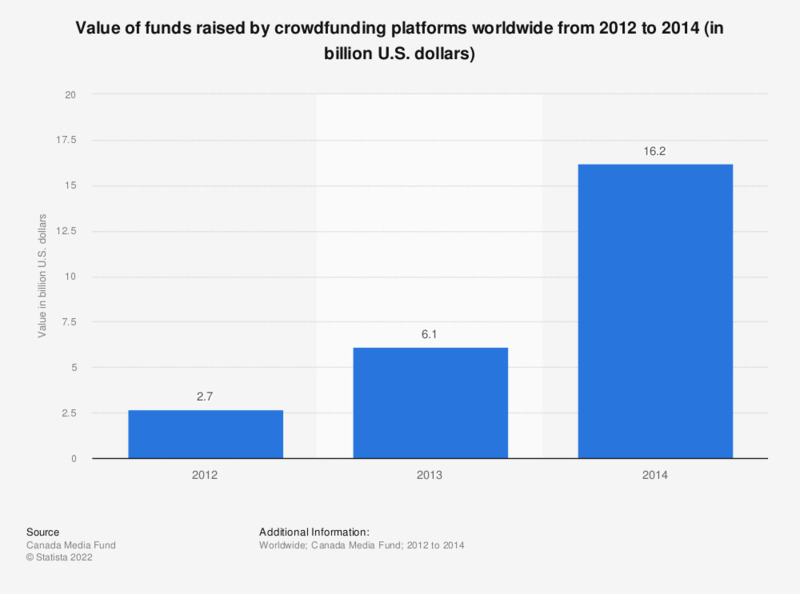 The statistic presents the value of funds raised by crowdfunding platforms worldwide from 2012 to 2014. In 2013, global crowdfunding platforms raised approximately 6.1 billion U.S. dollars. Crowdfunding, also called crowd sourcing, is a form of collecting money from large number of people all over the world, usually online, in order to fund a project run by individuals or companies. In the last years, the crowdunfing platforms have experienced a rapid growth and nowadays there are numerous crowdfunding websites supporting various projects. Crowd sourcing has become a form of alternative financing, an option of collecting money in the times when, especially after the 2008 financial crisis, banks have become very careful and not willing to extend the credit to less creditworthy applicants. The funding resources pooled in the crowdfunding campaigns have therefore supported, at least to some extent, the economic growth worldwide. The funding volume amounted to 530 million U.S. dollars in 2009 and almost tripled within the following three years as crowdfunding became more and more popular globally and gained new followers. In 2012, the majority of crowdfunding platforms were based in the United States and Europe. In Europe, the highest number of crowd sourcing platforms was available the United Kingdom, Netherlands and France.